When I was researching my all-ages guide to girl power graphic novels, I expected to come across some amazing books. I could not have predicted how much I would love Melanie Gillman’s young adult graphic novel As the Crow Flies, though. It’s beautiful in so many ways: from art, to story, to emotional honesty, to tackling tough subjects. I LOVED it, and I think you will too. Charlie Lamonte is thirteen years old, queer, black, and questioning what was once a firm belief in God. So naturally, she's spending a week of her summer vacation stuck at an all-white Christian youth backpacking camp. As the journey wears on and the rhetoric wears thin, she can't help but poke holes in the pious obliviousness of this storied sanctuary with little regard for people like herself… or her fellow camper, Sydney. Queer black teen Charlie’s parents have signed her up for a week at an all-girls Christian backpacking camp. Charlie has misgivings, but when she arrives and sees a room full of white girls she feels even more like an outsider. Charlie determines to stick it out – but along the way she questions her faith, her presence in the group, and whether she’s truly alone. How will the week end? One of the strengths of this book is that it is truly Charlie’s story. She’s at the intersection of a couple of marginalized identities, and very aware of that fact. Add in to the mix what is sometimes a hostile (or seemingly hostile) environment and faith into the mix, and the result could have been a muddle. But Gillman’s careful storytelling avoids that. Charlie’s internal dialogues are key to the story, and her honesty (both with herself and with others) is the key to moving forward and finding something positive to carry with her. A thread throughout the book is questioning the narratives that are being taught by society and the authorities in our lives – and in Charlie’s case, this means the camp story of the women who have gone before and been transformed by the journey (as told by the hike leader Bee). Charlie – sometimes openly and sometimes not – asks important questions that reveal racism and a limited version of feminism. Those around her react in a variety of ways that reflect reality: sometimes people learn and change, and sometimes they stick to their comfort zones. Meanwhile, Charlie’s struggling with her faith through prayer. I found those panels heartbreakingly earnest and honest. If it’s not clear already, I believe Gillman tells Charlie’s story with sincere, heartfelt grace. Readers will see that and respond to it. As the Crow Flies is quietly magnificent. And the art! I haven’t even covered it yet. The art is colored pencil and lovely – done in a warm color palette that works with the setting. The beauty of the art elevates the story. Gillman chose to illustrate some key scenes in creative ways – from overhead shots, to emphasizing tiny details, to grand panoramas. Seriously, the book is worth reading for the art alone. 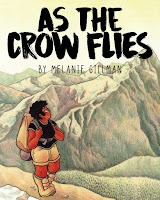 In all, As the Crow Flies is notable for its gorgeous illustration, unusual story in a usual setting (summer camp! ), and the kind, open, and unaffected way it tackles important topics. Recommended for: all readers ages 12 and up, and especially anyone interested in seeing religion, LGBTQ+ representation, and black teens navigating white spaces together in a graphic novel format. Oh, this sounds just wonderful! I'm glad your graphic novels research bore such excellent fruit, and I'm adding it to my TBR list straightaway.